Using LIC Login portal, there is no need to rush to your nearest LIC branch office just for checking status or premium due date. Because with time, LIC also has modernized. So, it has launched some e-Services to provide the best facilities to their customers. Also, the LIC India Login page saves your valuable time as well as your money. Here I have given login steps for both new users and registered users. Hence go through the below sections of this article to know about LIC Online Registration process. Life Insurance Corporation of India provides the LIC Login for its Customers, Agents, Development Officers and its Employees. In previous days, the customers of LIC have to visit the branch office to check the policy status and for the payment of premium. In today’s busy life, it is impossible to wait in a queue for hours for premium payment. Nowadays all the technology is based online, and thus LIC of India has introduced LIC Online Login/ LIC India Login for the Policyholder. By using this LIC of India Login, you can save the time and money which makes the work easy and faster. The Customer has to register in the LIC Portal by following LIC Online Registration steps. LIC Login Portal is standard for all the Customers and Agents of Life Insurance Corporation. There are no separate portals such as LIC Customer Login/ LIC User Login Portal, LIC Agent Portal Login/ LIC Agent Login, LIC Log in Page for Policyholders, LIC Development Agent Login Page. 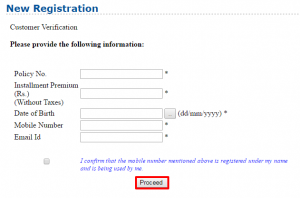 If you are a New User, you have to follow LIC Login New User Registration steps. The Life Assured can also pay the premium using LIC Online Login. Life Insurance Corporation of India is the state-owned insurance and investment company. LIC consists of 8 zonal offices with 113 divisional offices and 2048 branches. LIC India was started on 1st September 1956 with its headquarters in Mumbai. Life Insurance Corporation offers many plans to their customers such as Money Back, Endowment, Term, Child, Health Policies. The Customer can select the plan which best suits him/ her. The Insured can buy the policies online through LIClogin. All Details of LIC Policy Status, LIC Online Payment, etc., is provided on our site. 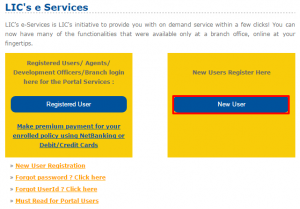 If you are a New User of LIC of India, you must register yourselves using LIC New User Login. LIC Customer Login, LIC Agent Login can be made through a single portal such as LIC Portal Login. The New Users have to follow the below steps for LIC Online Login. 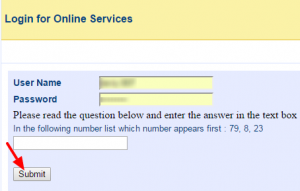 What are the Steps for LIC Online Login for New Users? 2. On the left side of the homepage, you will find the below image. 3. Click on LIC’s e-Services as shown below. 4. The below page appears on the Screen; in that select New User as shown below. 5. On the New Screen, the LIC India New Registration page will display on the screen. 6. Fill the necessary details such as Policy Number, Installment Premium, Date of Birth, Mobile Number, Email Id and tick that I Confirm. 7. Click on Proceed to get registered with LIC India. 8. After the registration process has completed, Username and Password will be created to their customers. 9. Now the Life Assured can use the Online LIC Log in to check the Policy Status and for the Online Payment. Visit the official website of LIC of India www.licindia.in. Click on LIC e-Services and select the Registered User as shown below. 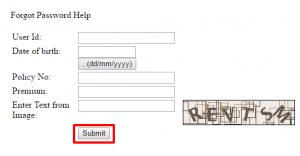 Fill the Username and Password and Click on Submit as displayed below. The Details about the Premium, Policy Status, and other details can get by the LIC of India Login. Thus the Policyholder can use the LIC Portal Login for Registered Users to make the premium payment online through Credit Card/ Debit Card/ Net Banking or for LIC Policy Status Check Online. 1. 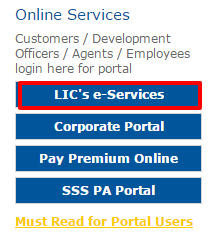 In the process of LIC Login Online, if the Life Assured forgets the User Id click on e-services on the home page. 2. A page appears in which Forget User Id Link will be available. 3. 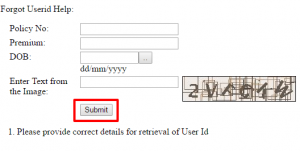 Click Forget User Id, it will direct you to the Forget User Id Help Page as shown below. 4. Fill the details such as Policy Number, Date of Birth and Premium. 5. The Text displayed in the image should be entered and Click on Submit. 6. The User Id will be retrieved if all the details provided are correct. Hence, at the time of LIC Customer Login process, if the insured forgets the User Id then he/ she can retrieve their User Id by following the above steps. If the Customer Forgot Password at the process of LIC Log in, Click on e-Services available at the left side of the Home Page. The Login Page will display on the screen which contains Forgot Password Link. By Clicking on that, a Forgot Password Help Page appears on the Screen. Enter the necessary details like User Id, Policy No, DOB, Premium, and Text Displayed. The information provided should be correct to get the password back. Now you can log in with your retrieved password. So, if the Life Assured forgets the password at the time of Login in LIC of India portal, then he/ she must follow the above steps to bring back their Password. The Policyholder can use the User Id and Password for entering the LIC User Login Portal to enroll policies of their life. By LIC of India Login, the Life Assured can easily pay the premium through Online Payment and can also know the Policy Status. The Life Insurance Corporation of India provides Online Services to the LIC Agents. LIC of India Agent Portal is an excellent way to keep track of all sold LIC policies by an LIC agent. The LIC agents portal was designed especially for the agents. The Agents can avail this LIC Online Service by using this LIC Agent Login Portal. For Successful login as an agent, you should use the User Id and Password. Once you receive your user ID and password, you can enter LIC Agent Login page easily. Always remember that your agency code is your username. And also use always ‘0’ (zero) before your agent code then log in. The LIC Merchant Portal is available for Agents, Merchants and SBA’s for premium collection. For making online payments of LIC Policies, one can use the LIC Merchant Login Page. The Login can be done by using the LIC Merchant Id and Password. To Check the Policy Status Online, LIC Login Portal is useful. If the Customer is not registered, then they should follow the steps explained above to Login into the LIC Portal. Make use of the User Id and Password to check the Policy Status by LIC of India Login. In the past days, Customers have to visit the branch of Life Insurance Corporation of India to pay the Premium. On the Start of the online LIC India Login process, the Policyholder can pay the premium amount (monthly, quarterly, half-yearly, yearly) from any corner of India at free of cost. This LIC Online Payment saves the time of the Life Assured. By using the User Id and Password, the LIC Online Premium Payment can be made by providing the details like Policy Number, Premium, Date of Birth, etc.